Set a pot of salted water to boil. Add pasta and cook according to package instructions. Drain well; set aside. Heat a 10-inch or larger skillet over medium heat. Add a drizzle of olive oil. Once hot, add sliced sausage and cook for 3 minutes, stirring occasionally to brown on all sides. Increase heat to medium-high. Add tomatoes and cook for 3 minutes, until blistered. Stir in garlic and cook 1 minute more. Reduce heat to medium. Pour in Holland House® Red Cooking Wine and simmer until reduced by half. 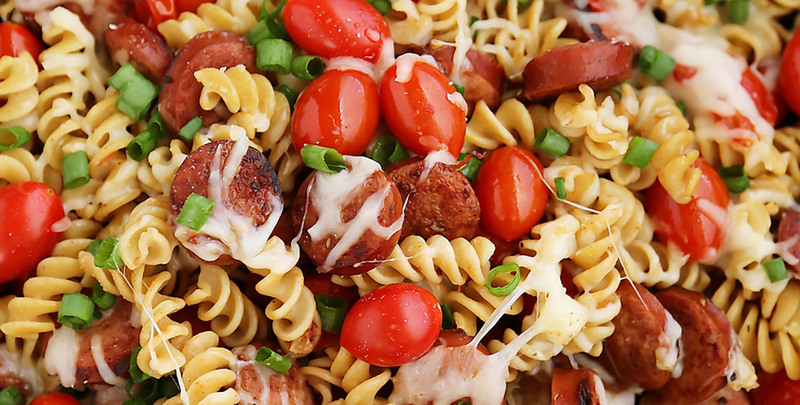 Stir in cooked pasta and combine with all ingredients. Season to taste with salt and pepper. Remove skillet from heat and stir in mozzarella. Top with scallions. Enjoy! Bold Boost #14: Pour ½ cup of Holland House® White Cooking Wine in your pan during the last 2 minutes of roasting for juicy chicken bursting with flavor.